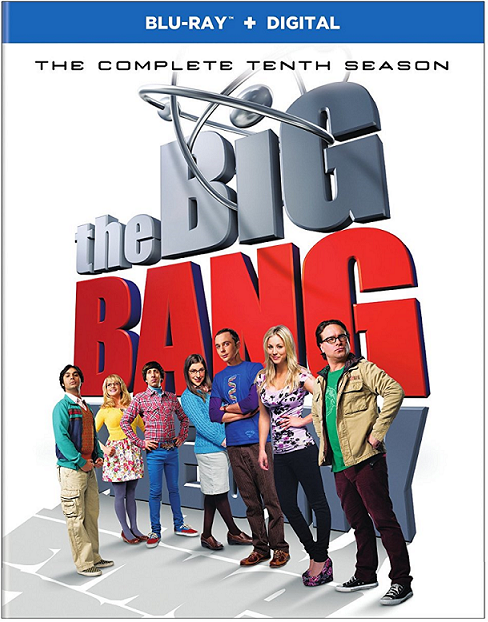 Article first published as Blu-ray Review: 'The Big Bang Theory - The Complete Tenth Season' on Blogcritics. CBS’s The Big Bang Theory completed a full decade on the air last spring. The 24-episode Complete Tenth Season, now out on Blu-ray, DVD, and digital, brought some changes to the sitcom. Relationships matured and deepened, the family expanded, and scientific advancement came with some challenges. While perhaps not as fresh as it once was, the series does remain entertaining, and this was a pretty good batch. The biggest changes in The Complete Tenth Season revolved, predictably, around Sheldon (Jim Parsons) and Amy (Mayim Bialik). Early on, they move in together. Unsurprisingly, it takes an abnormal event to push such an overdue, big step in their union. And yet, Sheldon handles it a lot more gracefully and openly that he would have even a year or two ago. Which makes their subsequent coitus more genuine. Sheldon will always be the Sheldon we were first introduced to in many ways. More important than these steps are the ways in which we see Amy soften him in all aspects of his life, as well as how he has matured in handling disruption. This is key for a series that’s been on this long. A little less groundbreaking is how the arrival of Howard (Simon Helberg) and Bernadette’s (Melissa Rauch) baby is dealt with. Yes, the inclusion of Raj (Kunal Nayyar) and Stuart (Kevin Sussman) in the plot make it a little more screwball. In general, though, there isn’t much difference in The Big Bang Theory‘s approach than how other situation comedies have done the same thing previously. The best parts are when we see Bernadette struggle with going back to work and Howard doubt his abilities as a father because of his own upbringing, and I’m glad they didn’t lean into either too melodramatically. Also, tying baby Hallie (Pamela Adlon, Better Things) to Howard’s departed mother is a great move. But I still wish they’d found a more original approach. Rounding out the ensemble, Leonard (Johnny Galecki) and Penny (Kaley Cuoco) are feeling pretty solid and comfortable this year, especially after their second wedding. Raj slowly gets his love life and independent finances in order. These both show evolution, but like the above, they contribute to The Big Bang Theory‘s leveling out, with less departure from the typical fare in the genre every year. There are some truly funny bits, such as how the pregnancy is revealed to certain characters. But overall, it feels like it might be time to start looking for an end game. Or switch to shorter, more focused seasons like some of the revivals are doing these days. As in the past, The Big Bang Theory – The Complete Tenth Season, has plenty of great guest stars. Besides the returns of Judd Hirsch, Laurie Metcalfe, Christine Baranski, Keith Carradine, Brian Posehn, Riki Lindhome, and the too-long-gone Brian Thomas Smith, we get Christopher Lloyd (Back to the Future), Jack McBrayer (30 Rock), Katey Sagal (Sons of Anarchy, Married… with Children), and Dean Norris (Breaking Bad). The show stays focused on its leads, as it should, but it has done a good job of filling in other key roles with terrific and appropriate performers, some of whom viewers anxiously await the return of. As far as extras go, the series brings back the charming #JustAskBBT segment, where cast members answer fans’ questions. There’s a featurette on family, which makes total sense, given the role relations played in several of the stories this year. There’s another on some of the more interesting props, one on the baby, and a humorous gag reel. The Comic Con panel from 2016 is also included, too late as in most releases. But what’s cool about this one is that it’s the writers and other behind-the-scenes people being interviewed, not the actors, and Rauch serving as a very energetic moderator. That makes it more fun than some of the other panels I’ve seen lately. The Big Bang Theory – The Complete Tenth Season is on sale now.